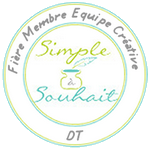 Ce matin j'ai 2 projets différents à partager avec vous. Au printemps passé, j'ai commencé un album avec mes photos de bébé, et par manque de temps, je l'ai laissé de côté. Dernièrement, je me suis réinscrite à l'atelier de scrapbooking offert à notre centre culturel, avec la ferme intention de travailler sur cet album uniquement. Je vous présente ce matin la jumelle de cette première page. This morning I have 2 different projects to share with you. The first one is a scrapbooking pages, for an album I started last spring, that was left uncompleted because of lack of time. Lately, I joined a group of scrapbookers at our local Cultural Center and made the completion of this album a priority. I had already made the first page, below is her twin sister! Voici les 2 pages, côte à côte. A view of both pages in my album. J,ai repris le sketch de la première page, mais je l'ai disposé différemment; j'y ai placé 2 photos, une de ma maman seule et une avec mon papa. Sur une étiquette en carton aggloméré, j'ai collé l'annonce parue dans le journal local. I used the same sketch, turned around the elements; showcased 2 pictures, one of my mother and one of both my parents. A lovely chipboard tag with the annoucement of my birth in the local paper is slipped under the main pannel. Un gros plan pour mieux voir le détail de la forme sous la photo. Je manquais de papier, alors j'ai tenté d'imiter mon papier design en embossant une étampe de SU - Stitched et en encrant le carton jaune. A close up of the resit-technique I used to imitate the design paper. The stamp is a SU- background called Stitched. Voici un gros plan de l'annonce que j'ai collée, et couverte de ModPodge sur l'étiquette, préalablement embossée et encrée avec la même étampe que la forme sous la photo. A close up of the tag. To protect the newspaper add, I covered it with Mod-Podge. Mon 2e projet est un signet doré! J,aime beaucoup créer des signets, les personnaliser pour les offrir à des personnes chères. Celui-ci est pour moi! je l'ai fait tout en jaune, comme une belle journée d'été. Cette petite fleur me rappelle la Floride, j'ai oublié le nom, mais je me souviens du parfum qu'elles répendent le soir... une jolie libellule, une petite plume et des billes couleur de soleil. On to my 2nd project, a cute gold bookmark! I enjoy making bookmarks, when I create them, I think of the person to whom it will belong, and let myself be inspired. I created this one for me! :) It is the cute little flower that reminds of Florida, and summer that inspired it. n'est-ce pas que c'est joli glissé dans ce livre ... Tome 4, de Mémoires d'un quartier, de Louise Tremblay-D'Essiambre. J,adore les longues sagas, et celle -ci me plaît tout particulièrement. Je suis devenue une fan inconditionnelle de Madame Tremblay-D'Essiambre. thank you so much for stopping by! I hope you enjoyed my projects, and they will inspire you. I should post again next week, as I will complete my dictionary page, this time the challenge is with letter E. Have a lovely weekend. Wow Danielle, both your creations are beautiful. The scrapbookpages are gorgeous. The swirls and details are perfect matching with the pictures also are the colors. Also the tag is great although I cannot understand it LOL. You can see the love you put in those pages. Now your golden bookmark. Wow, love it in every way. The colors are stunning. You are so creative in many ways and I can not say it enough I am so glad we met through the internet sweet Danielle. Hi Danielle and I think it's great that you joined a group for your Scrapbooking and that it's already resulted in these beautiful pages. I think it's wonderful that you have a picture of you and your parents at the hospital when you were born, great foresight on their part! I really love your layout and the elegance of it too. The bookmark is so pretty and great that it reminds you of a holiday, can't think of a nicer way to keep your page either. I'm interested in your book actually, I love a family saga myself and the artwork on the cover is great too. Your scrapbook pages are beautiful...gorgeous die cuts and a lovely tag....hmmmmm...what a great idea to use Mod-Podge to protect the announcement. 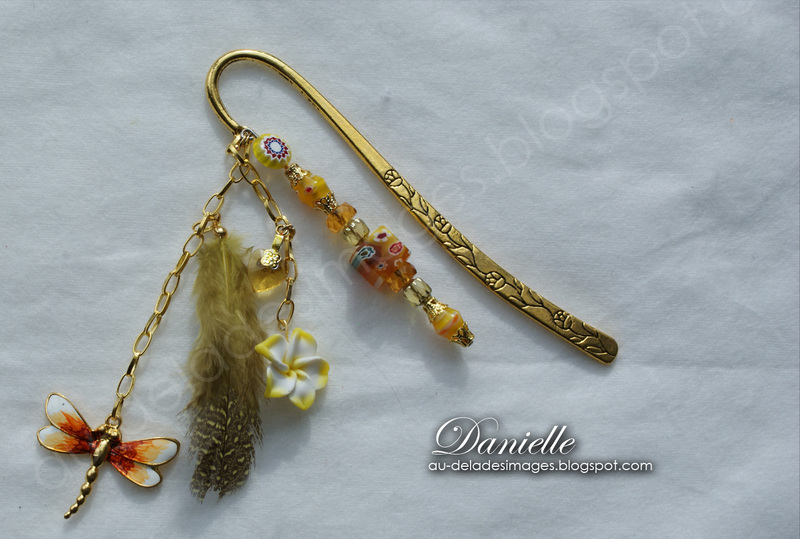 Your gold bookmark is a stunner...gorgeous beads and interesting elements! Lovely projects!!!! Danielle!!!! What amazing project!!! It´s wonderful how you are doing your history!!! It´s memories for ever and I love this!!! Your bookmark is also stunning!! oh la la oh la la ces 2 projets sont magnifiques! j'adore le design de tes 2 pages si sobres et élégantes! Your scrap book pages are beautiful! Gorgeous die cuts and your embossed DP's are wonderful. So creative my friend. Now about that book mark... Holy smokes this is awesome. Your talent is downright fabulous and reflects all the love that you pour into each project. I can hardly wait to see your dictionary page! Hi Dear Danielle!!! Oh my goodness, these pages came out GORGEOUS!!! 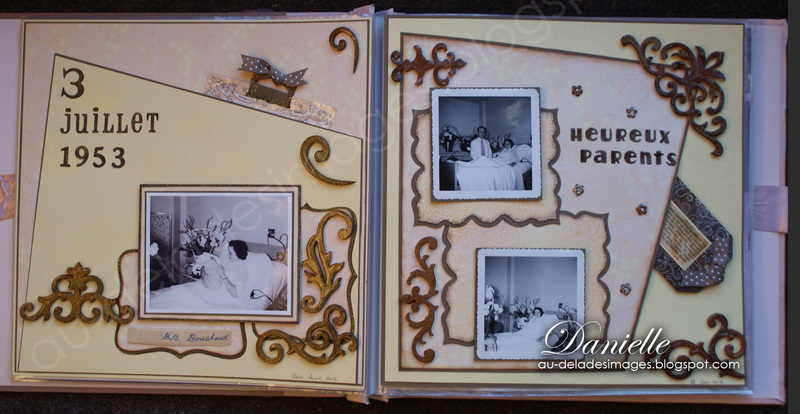 I love the vintage feel to them, and all of the scrolls .. it really adds to the "vintageness"! And all the die cuts you've used too .. it's PERFECT!!! Everything, even the colors of the papers .. you gave everything just the most coziest feeling! I love it! And your beads .. ahhhhh .. your beads are divine!!! What a CLEVER idea, and it's such a GORGEOUS bookmark to be used!!! I love it! Hey Sugar! Your scrapbook pages are wonderful, I know you are happy working in it again.n And lucky you, you have a group to work with too!! Now Danielle - you JUST have to teach me how to make that beautiful book mark -- I want to make some too!! Looking forward to your letter 'E'! I love your pages, beautiful parents too. You are so multi-talented. 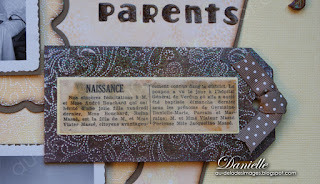 I think the stamping on the paper is a great idea, and those tags are so sweet. I love the design and it is very elegant, just as it should be for your name is elegant! I really love that you are going to finish this book and it will be loved by your family. I also love your bookmark it is so cute and the pretty beads and dangling things, all that I love too. Thank you for sharing such awesome projects with us. I enjoy your work. Bonne fin de week-end Danielle...j'ai hâte de voir la suite de ton album...Bises! 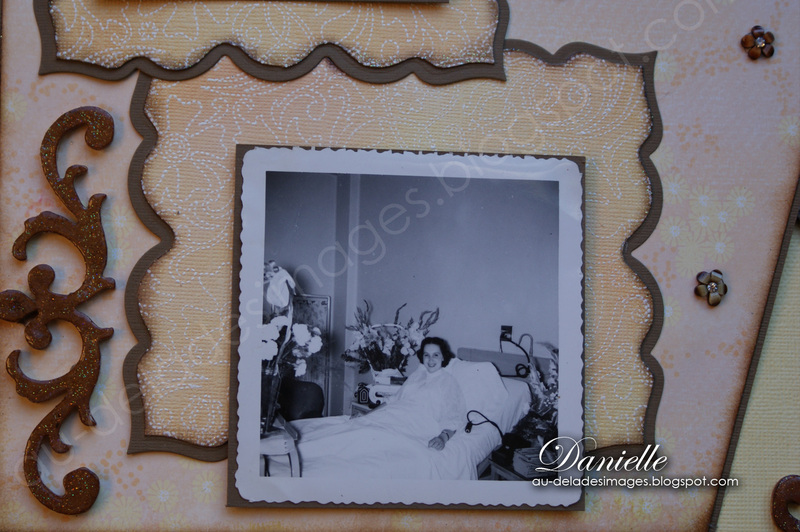 Your scrapbooking is beautiful Danielle. I ahve never made one before and yours really inspires me to make one of my Mother who has since gone to be with the Lord. i love the design you have used with those lovely corners. your bookmark is beautiful. such a great idea and reminder of a happy time. superbe Danielle tes pages et j'adore ton marque page,j'en ai jamais crée tu me donne le goût d'essayer!! 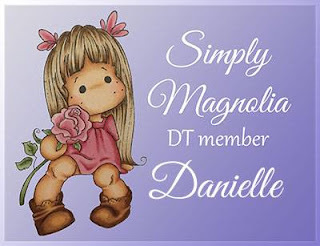 Fabulous pages Danielle, I love your designs and colours. What wonderful photos of your parents for the memory of your birth and stunning chipboard details!!! 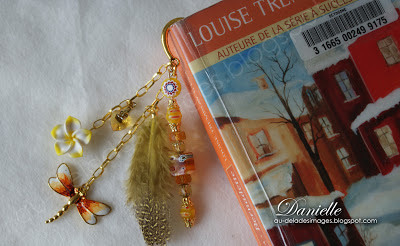 Your bookmark is beautiful, I have just been looking for one to decorate - I can't find it anywhere - probably in a book. If I found it I shall be providing me with inspiration!!!!! !